Whether you like the idea or not, Android-based cameras are now something you can buy. The $350 Nikon Coolpix S800c, for example, was announced back in August, while AT&T is selling the Samsung Galaxy Camera for $500. Buying the latter model will also mean you'll be getting cellular connectivity on the device via the carrier's cellular data network, so you'll be able to surf the web or download apps. 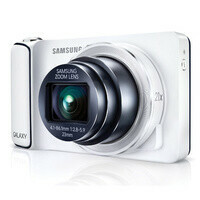 However, AT&T might not be the only U.S. carrier interested in the Samsung Galaxy Camera. The device just appeared at the FCC with support for Verizon LTE bands. This, of course, does not guarantee that Big Red will launch it, but it definitely raises the chances of that happening in the near future. For those who need a refresher, the Samsung Galaxy Camera is a 16MP point-and-shoot with 21x optical zoom running Android 4.1 Jelly Bean. It is powered by a quad-core processor and on its back resides a 4.8-inch touchscreen. You can't use it to make phone calls, but the Google Play software catalog is at your disposal. Can we make VOIP calls? You can make VOIP calls with skype with just about any device running android, I bought a galaxy s3 from verizon and using my tablet simcard i make and receive phone calls with skype. Only 40 dollars a month instead of 120 i was paying on their share plan. I will probably get this camera and i can use it to make calls and text messages with Google Voice, if the situation calls for a good camera. Thats a brilliant idea! I never even thought of that or even using Google voice. I think you just saved 80 month. The S4 may come with a 13 megapixel camera, smartphone cameras are improving so quick, iphone set the standard and i know samsung will try to beat them by implementing an even better camera on the S4. This is really interesting (if it means what I think it does). If the camera becomes a data access point (like a tablet) on the VZW network, pictures taken with the camera can then be shared wherever. With a traditional (non-phone) camera, photos must be uploaded to a PC and then shared. Sammy's camera has a huge (21x) optical zoom capability, which puts it potentially in the same (possibly better) class as the Nokia PureView 808. Add in Android v. 4.1, and things potentially get really interesting for all the reasons mentioned (Skype calling, surfing the Internets, etc.). The only downside would seem to be the hit to the cellular data plan.... 16 MP image sensor must generate some nice-sized image files. I remember Samsung releasing a flip phone with a 2 - 3 MP camera that had optical zoom, before the whole smart phone boom. It'd be nice to see Samsung push the envelope in this segment again. The problem is that for $500 you can pick up a much higher quality Canon/Nikon/Sony DSLR or a much better big zoom from Sony, Canon, Fuji or Panasonic, and many of those cameras now have Wi-Fi for easy sharing. I realize the DSLR's are bigger cameras but the photos are of much, much better quality. Samsung doesn't make very good cameras, compared to the big boys. Sorry to dissapoint, But iphone did not set the standard. Iphone was still stuck on a 5 megapixel camera when phones were coming out with 8 megapixel cameras. I had a similar thought after my last post. Best Buy has a few Sammy WiFi cameras. Looks like I will be heading off to Best Buy in the very near future. If one of the cameras has a true WiFi hotspot-like function (where you can use the camera to access the phone WiFi hotspot and then get to the Internets to upload the photos via e-mail or some other non-complicated method, I probably will be pulling the trigger on a camera. This would be perfect for me to use for school & for my spare time. Samsung - win. 4.8 incher - win. Jelly B - win. Data/Wifi connectivity - win. 16MP w/21x zoom - win. Price tag - :/...we'll see.